Jolie Maxtin: Boy Charity Quilt - Check! 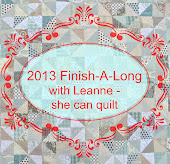 I have a goal in mind for charity quilts this year, and this is one completed. Our guild is doing a challenge for a local organization and this is, what I hope to be, just one of the donations towards the greater goal. More details to follow but I wanted to share it as it enables me to check something off of my Q2 Finish-A-Long list too - Yippee!! I picked this pattern because it was fast and easy. It will be used as a nap quilt in a youth department, which is why it comes in at only 24" x 36". Wow! Very nice! I'm trying to figure out what I want to do and you are done! Beautiful quilt! You are going to make some lucky boy very happy.